Fri, October 26, 2018 4:30 P.M. Inspired by quick Chinese greens cooking methods, chef Valerie Erwin of EAT Café will demonstrate a favorite collards recipe rich in nutrients and flavor. Enjoy tastings and leave with recipes featuring a whole new take on seasonal cooking greens from your garden, grocery, or pantry. This Culinary Literacy Center program is presented in conjunction with the It Takes a Region Conference and in partnership with the Greater Philadelphia Coalition Against Hunger as part of our Good Food for All program series designed to build skills, strategies, and community among people facing and fighting food insecurity. This program is open to both conference attendees and the general public. Pre-registration is required via Eventbrite; tickets are $10 per person. If you are SNAP eligible, please call 215-686-5323 or email kitchen@freelibrary.org to register for this program free of charge. 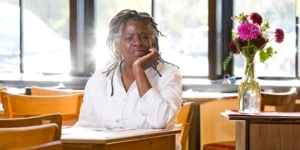 Valerie Erwin is a longtime Philadelphia chef who, for 12 years, owned the critically acclaimed Geechee Girl Rice Cafe. She specializes in the food of the Low Country—the coast of South Carolina and Georgia—where her grandparents were born. During its tenure, Geechee Girl was featured in every major Philadelphia publication including the Philadelphia Inquirer, the Philadelphia Daily News and Philadelphia Magazine. Valerie is excited to bring her talents, love of food, and passion for community to the EAT Café, a Philadelphia-based non-profit, pay-what-you-can café that nourishes, educates, and unites community in a welcoming environment.